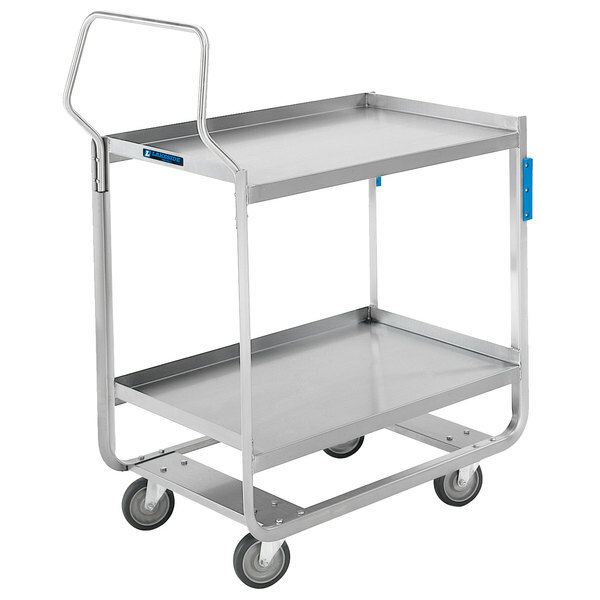 Lakeside 4943 Heavy-Duty Stainless Steel Two Shelf Handler Series Utility Cart - 39" x 22 3/4" x 39 3/8"
The smart choice for maneuvering throughout any confined space, this Lakeside 4943 stainless steel two shelf Handler series utility cart will serve as an essential piece of equipment for your foodservice operation. This item boasts two 21" x 33" reinforced shelves with a clearance of 21". Additionally, three raised edges on the shelves help hold items during transport, while one edge is down to make loading and unloading easier. Stainless steel construction and an angled U-shape frame add extended durability, along with making the cart easy to sanitize and clean when not in use. For added convenience, a unique ergonomic vertical handle offers more control for swiftly guiding the cart, and integrated leg bumpers will protect walls and furniture. Other features include a sleek, sturdy design and total of four all swivel casters that are fitted with no-mark, extra-load cushion tread wheels. The Lakeside 4943 utility cart is recommended for heavy-duty use and features a 1000 lb. weight capacity.